I have a fun birthday card to share with you today. I made it with images and sentiments from "Fruit Medley". This is such a fabulous set. 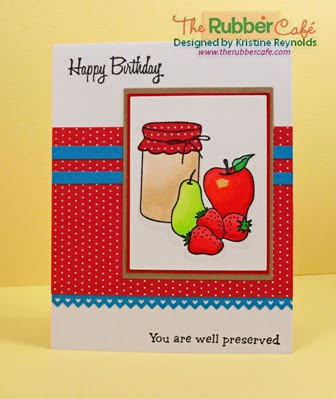 It has so many sentiments and images that the projects and cards you can make from it are endless! The patterned paper is Cosmo Cricket and I think paper piecing the lid of the jar was the perfect way to tie everything together! If you haven't picked up "Fruit Medley" yet after seeing all the awesome projects the design team has shown you I can't imaging why not!!! I hope you enjoyed this card and will stop by again soon to see what else the ladies have to share!